Home » News » Archive » ITN Ocarina film released Cameras, Action, Roll! ITN Ocarina film released Cameras, Action, Roll! Well actually there’s only one camera… and a very busy cameraman! Tommy Relph has filmed in the Arctic and in Afghanistan: his mission today, to “capture” ocarina-playing children in Kent. He found children at St Lawrence’s CE Primary in Seal and at Sevenoaks Primary all playing their Oc® and demonstrating their skills to intrepid news reporter Nick Thatcher. 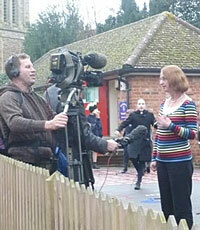 At St Lawrence’s, Headteacher Alison Saunders let her children do the talking as Jack taught Nick to play. Jack then joined his Year 5 & 6 friends to play Yellow Bird in 2-part harmony. Not bad for their first term on the Oc! Alison notes that, for her competent musicians, ocarina playing is a “great extension activity and enrichment to their musical experience” and for other children in her school, who play no other musical instrument, it is a “fantastic introduction to the world of music”. After a whole-school performance of Twinkle Twinkle, with everyone following the music effortlessly on the whiteboard, it was on to meet Miss Orledge and Class 3O in Sevenoaks. The Year 3 class (7 year olds) had received their ocarinas in the week before half-term and, just five weeks later, were deciding which of several tunes from Book 1 they preferred to play! After a speedy Old MacDonald had a Farm and an impressive scale of notes, it was all ‘in the can’ – children filmed from every conceivable angle. Year 3 Class teacher Penny reflected on five weeks of whole-class ocarinas, saying it had promoted “every child’s self-belief as a performer” and developed “teamwork and self-confidence to have a go at something challenging”. When Nick asked if the children enjoyed playing, their roar of approval suggested they’d be playing plenty more tunes on their ocarinas over the next few years. Thanks to ITN and to the children and staff at both schools for all their professionalism, good humour, patience and hard work. The film is now showing on the Home page of this website and in the Video section.